Urban renewal. White flight. Gentrification. Sprawl. All these buzzwords, with their range of charged connotations, attempt to label a feature of American life that has been evolving since cities began forming. Academics, civil servants, and activists have taken up this issue and unraveled a spell of well-meant documents and movements. Nevertheless, a combination of rent hikes and legal loopholes and money continue the churn of repurposing entire communities in the name of capitalism. As podcasting continues its steadily increasing presence in the hearts, minds and smartphones of millions around the country, it’s only natural that practitioners of portable audio take a crack at surveying the complexities of our ever-shifting urban landscape. From its perch in San Francisco, public media outlet KQED has a front row seat to a saga surely playing out in many metro areas nationwide. In American Suburb, hosts Devin Katayama and Sandhya Dirks tell the story of Bay Area suburb Antioch as it adjusts to life under the realities of a shifting populous. In truth, gentrification is not entirely foreign to podcasting. Shows like Placemakers and Third Wave Urbanism take a docu-narrative approach centering the discussion on their respective municipal angles. And a number of others have featured the topic in one-off episodes, from the earnest ponderings of For Colored Nerds to the staunch finery of the BBC. 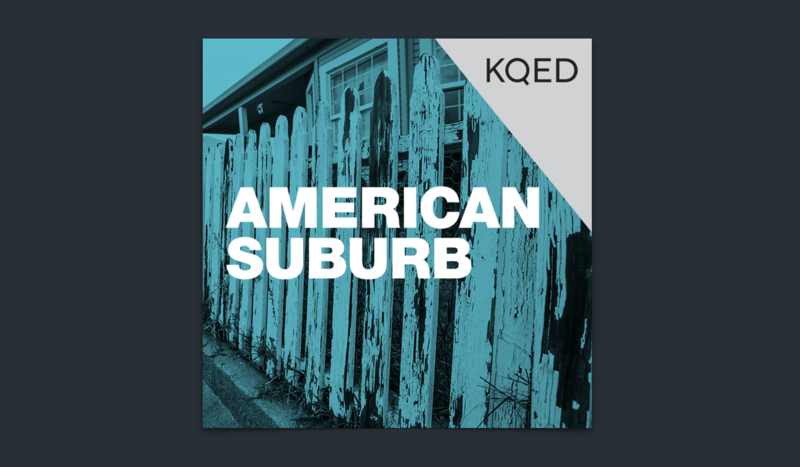 But American Suburb’s only real contemporary is There Goes The Neighborhood, a bicoastal collaboration between Santa Monica’s KCRW and New York City’s WNYC. While the public radio overlap is apparent, the shows also share a focus in their intent: to reveal the variety of ways in which demographic shifts are impacting a specific. The main difference is the size of the subject matter. New York City and Los Angeles are the largest urban areas in the United States, and Antioch is a suburb of 100,000. This dictates that There Goes The Neighborhood take a broader scope, focusing on the larger changes altering highly-prized patches of urban land, while American Suburb documents the stories of those affected on the fringes after the dust from the land-grabs has settled. Make no mistake – the actions that usher in new storefronts and agitate the housing market are essential to this conversation. Ignoring the emergence of craft breweries and luxury condos would be akin to skipping a battle sequence in order to more quickly assess its outcome. The displaced and displacers are inexorably tied, and any hope of future coexistence depends on taking a holistic and nuanced approach. Yet the latter end of that journey often seems left to the imagination. What American Suburb offers a brilliant segue from the frustratingly elusive question “what is happening” to the less glamorous but all the more important inquiry “where has it lead thus far?” And by framing big picture issues with the help of human details that populate the day-to-day, the show winnows away at the complexity inherent to urban emigration. It’s essential to note that American Suburb also tells some undeniably agonizing stories. The tale of an Islamic Center being burned to the ground and the resulting community’s debate on whether or not to remain in Antioch resonates with current tensions around religious groups in the age of travel bans. The chapter covering a homeless enclave highlights the difficult juxtaposition of a semi-idyllic, white picket fence Americana with utter destitution. But the show is also quick to credit people with a hard-won agency to enact positive change in their community. While tragedy is inherent to the overall narrative, these people aren’t a mass of faceless victimhood. In ‘How to Change Your Mind,’ we hear about a community leader named Iris Archuleta who proudly proclaims her affinity for Antioch despite having grown up in San Francisco’s Haight-Ashbury neighborhood. ‘Rabbit Hole’ champions the modern folk hero qualities of Doug Stewart, a resident who literally rescues the homeless and even invites them into his home. KQED is a public entity based out of one of the most famously liberal cities in the country. Given this context in which American Suburb is produced, the narrative balance could have slipped into fiercely politicized grand-standing. But the reportage captures a wide enough variety of voices to refrain from such pointed cajoling, and the resulting tone of the series is equitable and forthright. Katayama and Dirks don’t inject their voices into the story all that often, a credit to the professionalism so clearly on display in the series. The hero is the story, the oft-pursued and less oft-realized goal of public media. With the successful merger of form and intent, the series has the power to reach people earnestly seeking to learn about the ripple effects of our shifting urban landscape. Much like Invisibilia or Hidden Brain, American Suburb takes a closer look at forces that are as evasive as they are integral to the human experience. While the show is rooted in the style of so many intrepid public radio-type documentaries, it’s a new take on an important and constantly evolving part of civic life. Entertaining and deeply human, any listener who has ever relocated to a new community (whatever the size) will find resonance in at least a few chapters of this well-hewn work of audio journalism. American Suburb would have advanced the form by mere virtue of adding a new angle to a familiar if lightly trod subject in the realm of podcasts. This relatively epic endeavor told a story that could impact debates on the far-reaching decisions that push people out of their homes. The podcast speaks to local media’s unique ability to tell intensely regional stories that can also appeal to outsiders. Antioch is a story unto itself, but the challenges and triumphs found within American Suburb could undoubtedly map onto countless other suburban communities. Whether or not other stations take up the charge and follow suit will remain to be seen. But KQED’s look into the aftermath of urbanization serves as an adept model ripe for future adaptation.